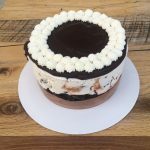 Want to get a large amount of ice cream or a special ice cream cake for a special occasion? We can accommodate requests with 48 hours notice. Unfortunately we are not able to offer delivery, but ice cream and ice cream cakes can be picked up at our shop during open hours. You can select an approximate pickup time on the Checkout page when placing your order. 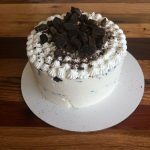 When picking up orders, please remember that ice cream melts quickly and plan your ice cream or ice cream cake pickup accordingly! We suggest keeping a cooler handy, and purchasing a small amount of dry ice for longer drives. 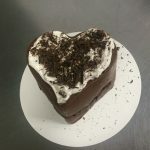 All of our ice cream cakes are made fresh to order, and every ice cream cake includes 2 layers of ice cream with additional fillings like brownies, cookie pieces or hot fudge. Choose one of our creations, or customize your flavors and fillings. Our production schedule may affect lead times. We are in the kitchen Monday through Friday. If you place your order after 2pm on a Friday, please select a pickup time no earlier than the next Tuesday. 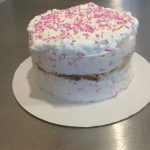 Additionally, if you choose “other” when ordering a gallon or custom cake, please call the shop at 919-564-7999 to verify that your preferred flavors will be available. It’s best to call on a weekday from 9–5 to ensure you reach someone in the kitchen. 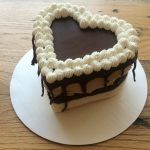 But please note that because production schedules can vary, so some of our listed flavors may be unavailable or require an extra day’s lead time. If we can’t make your order on time as requested, we’ll contact you to discuss refunds or substitutions.